“Wait, is my tongue actually freezing?” This unique, and rather ridiculous thought entered my mind just after sun rise on day two of the Canadian Ski Marathon, or CSM for short. I was about 25 kilometres outside the quaint town of Montebello, Quebec, en route to La Chute, located an additional 60 kilometres down the trail. I had learned not to think much about the total distance remaining. A distance which seemed almost impossible. 60 kilometres would be the longest nordic ski of my life, if I hadn’t just skied 82km the day before. Like any large task, the best strategy for completion is to break it down into manageable chunks. Complete those one at a time, and eventually come to the larger goal made up from those smaller parts. Where I stood, I was on Section 4 of the 10 sections that make up the full Coureur des Bois route of the CSM. I only had 3 sections remaining, and with section 4 being the longest of those remaining at 21.1km, through my shaky rationalization, the end seemed achievable [Coureur des Bois is French for “runner of the woods”, or “lumber jack”, the CSM emulates the travel of the Coureur des Bois of the past as they carried furs, letters, and other important items across Quebec]. Playing the numbers game can be a welcome distraction when you are spending nine to ten hours a day on your skis. It’s a simple game to play as the metres tick by. But at times there are more immediate concerns. In this case, a possibly frozen tongue at risk of frost bite. Day 2 of the CSM began at 6am in frigid -20 degrees Celsius, with winds gusting up to 30 kmph, which brought a biting wind chill. I had looked at the forecast shortly after my 4am wake-up and I thought I had dressed appropriately for the weather. Thick merino wool socks, wind proof briefs, thermal long john’s, insulated ski pants, thermal synthetic long sleeve base layer, a thermal long sleeve cycling jersey, a heavy primaloft insulated parka, balaclava, toque, clear lens sun glasses, wind proof gloves, and over-mitts. Every square inch of bare skin was protected from the cold. Except for that moist fleshy muscle inside my mouth. Now, thawing out anything in your mouth seems simple enough; “close you mouth, stupid”, then let your body’s natural furnace do it’s thing. The problem with skiing with your mouth closed is that you’re still required to breathe. Breathing out my nose, the moisture in my breath instantly froze to the lenses of my glasses, rendering me blind. So there I was, blind, with a freezing tongue in the middle of the longest cross country skiing event of my life. Like so many things in sport, the answer to my predicament was simply to suffer through. The concern of a frost bitten tongue is likely quite irrational. So I continued down the trail, stride after stride, metre after metre, until eventually, I reached my goal that seemed nearly impossible a few hours before. 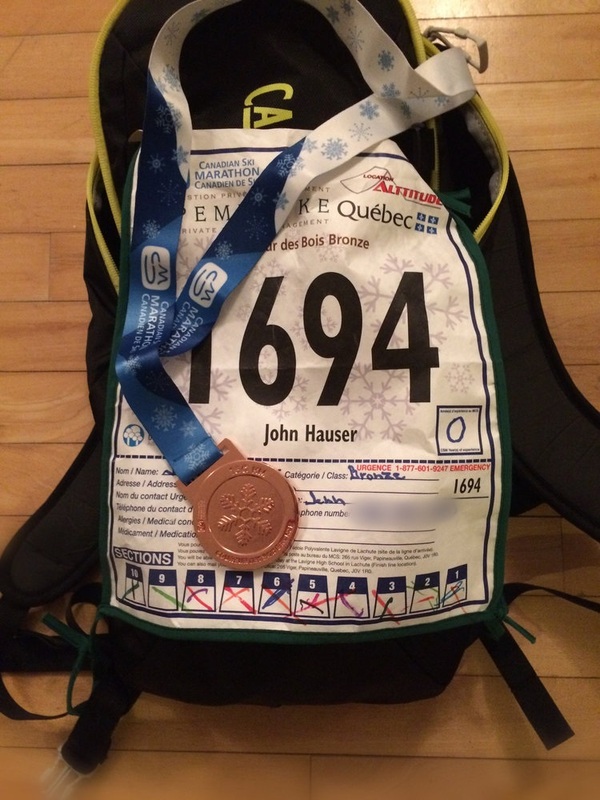 163 kilometres across the terrain of the Laurentian mountains from Mont Tremblant to La Chute.